1.You can choose the same with the printing machine platform ,in addition ,Single and double panel location convenient and high flexibility ,To ensure the printing accuracy. 2.Printing screen can be rotated 45 degrees, with a high repeat precision,can be comparable to the machine. 3.Using steel net mobile school edition, and connecting with the printing platform X, Y axis fine-tuning calibration, convenient and quick. 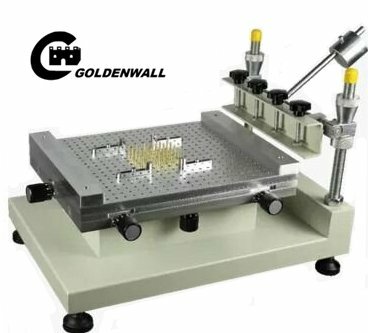 4.Frame made of thickening machine is superior material selection and strong, durable;Steel mesh stent using spiral screw up and down, adjustable height, convenient to control the thickness of the PCB.